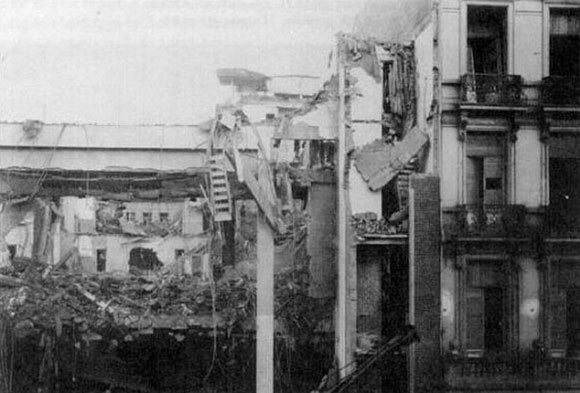 My mother sent me an e-mail of stories and pictures from a website detailing the V-bomb attacks on Antwerp late in World War II. Imagine this: you are a fourteen year-old girl. It's a couple weeks before Christmas and all your friends want to go to town to see the new movie. They want you to come too. You say you can't afford it and want to save the money for Christmas. They plead with you and try to get you to come along and won't take "no" for an answer. You have a hard time convincing them (and yourself) that you don't want to come, but eventually they give up trying to drag you along and go without you. The cinema gets hit by a bomb and all your friends die. The Rex Cinema, Antwerp, Belgium. December 1944. "Stay the Course" no one likes a "Flip-Flopper"